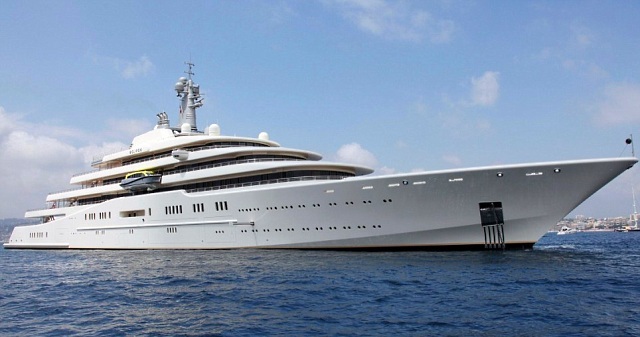 Almost the most expensive and the best boat in the world of luxury belongs to Roman Abramovich. The general condition of the well-known policy of «Business Insider» in Russia, estimated at $ 12.8 billion. 163-meter-long ship has a 22-meter wide and four engines, a cinema, two helipads, a conference room, a playroom for children, a beauty salon, 2 swimming pools, a dance floor, a sauna, 30 cabins. Bedroom on the ship also armored, and her window of bulletproof glass. Megayacht Eclipse is a luxury motor yacht built by the shipyard Blohm + Voss and launched in Hamburg on June 12, 2009. Her appearance and interior were developed by Terence Disdale Design, and the French architect Francis Design was responsible for the marine architect. After all the tests, the yacht was delivered to Roman Abramovich on December 9, 2010. With a length of 162.5 meters, Eclipse is the second largest private yacht in the world, because it is 17.3 meters shorter than the Azzam yacht, which was launched in April 2013. The cost of the yacht was estimated at € 340 million (approximately $ 475 million in September 2011), but the report in September 2009 showed that the cost of construction could come close to € 800 million or $ 1.12 billion. The final cost was reported to be as much as $ 1,500,000,000. Eclipse has two landing areas for helicopters, 18 guest VIP cabins, two swimming pools, several jacuzzis and a state-of-the-art disco hall. It is also equipped with three luxurious tenders, a minisubmarine, which is capable of submerging to a depth of 50 meters and even an anti-missile system. In addition, the owner’s luxurious cabin and the bulwarks of his walking deck are fully sheathed, bullet-proof glasses in the windows and there is even a laser system against the paparazzi intending to take a close-up photo of what is happening on board the ship. Serving all these joys of Abramovich’s life are 92 team members. In August 2011, Eclipse delivered to its owner troubles in Antibes on the French Cote d’Azur. Due to the huge size of the ship, there was no place for him in the «Millionaires Bay» — the largest marina in Europe with more than 2 thousand berths — and had to anchor at a distance from the places of active recreation. Abramovich already appealed to the authorities of Antibes with a request to allow him to build a personal pier near his own castle Chateau de la Croy, but was refused.